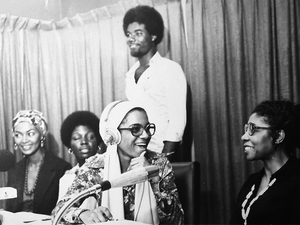 This year Fae Ellington celebrates her 40th year in Jamaica’s media and arts. She has rightfully been lauded by her peers on numerous radio and TV shows with the latest being on Television Jamaica’s “Profile” where Fae was interviewed by regular host Ian Boyne. The interview must have been one of Boyne’s easiest ever as Fae just talked incessantly and rolled off so many engaging stories. In fact she regaled so much information about her career and family background that Boyne at times asked questions that Fae had answered minutes earlier. Fae has been a radio and TV journalist, broadcaster, an actress, a member of the Jamaican Folk singers and lecturer at the University of West Indies to begin with. I can vaguely remember her being on programmes such as “Bamboo Lounge” and “Spotlight” during the 1970s. But Fae became a regular for me when she presented Jamaica Broadcasting Corporation’s (JBC) ground breaking breakfast show “Morning Time”. Fae co-hosted “Morning Time” with former all-round sports great Lindy Delapenha. The on-air chemistry between Fae and Lindy was comedically perfect and so infectious. It made the show a must watch as you were guaranteed a laugh (which I needed) before I headed out to school on the daily zoo-truck of a bus to Glenmuir High. During a spell on the mid morning show on Radio Jamaica (RJR) the handover banter between breakfast host Alan Magnus and Fae were some of the funniest parts of both shows. Whenever I have returned to the Jamaica on holidays Fae was always on the air somewhere. I enjoyed the weekday evening radio current affairs programme that she did with the late Hugh Crosskill. Fae did remark on” Profile” that some were surprised that she had a brain to do such a strong current affairs programme. Fae’s broadcast of live events gives the viewer a calm assurance that she has prepared with methodical precision for the coverage she was relaying. As evidenced by the latest Independence Day awards ceremony at King’s House and the funeral for former government minister Roger Clarke. Fae waxed lyrical on the tremendous support she had from her mother and grandmother [she first met her dad when she was 21]. She also complimented her small group of friends and peers that assisted her through the good and challenging times. Such as the actress and broadcaster Leonie Forbes. Fae admitted to Boyne that part of the key to her success is that she does not carry any hatred (“memba fi hate”) or jealousy. High standards is one of Fae’s requisite for the success she has had. “You practice until you cannot get it wrong” is a favourite mantra of hers. A take on the Six Sigma business model. Fae did not give the impression she will be hanging up the mic, headphones or lecture room for a long time. But I hope she finds space to pen her autobiography similar to her good friend Leonie. As a pivotal player in the post independence era on Jamaica’s media and arts Fae’s story is worth recording for generations in words and photos. Just like this excellent photo below. “Profile” is generally a 25 minute programme but Fae’s discussion with Boyne deserved an hour interspersed with footage of her work so far. The girl from Smithville, Clarendon has done spectacularly well. This entry was posted in jamaica, jamaican, journalism, media, radio and tagged fae ellington, jamaica, profile, tvj. Bookmark the permalink. Memories. Definitely a force to be reckoned with. In south Florida we were lucky to have her teamed up with the late Charles Hyatt as they emceed local productions. Their banter alone was worth the price of admission! !